The Oracle of Omaha has reason to feel happy. Berkshire Hathaway Inc. (NYSE:BRK.B)posted blowout results on Aug 4, with second-quarter earnings surging 182% year-over-year on a reported basis. Some analysts have been skeptical of these results since it takes into account unrealized gains from the company’s stock portfolio into account. But Berkshire did show overall improvement during the second quarter. Importantly, the company took a major step by allowing its management to tackle the lingering problem of its massive cash pile. At this point, it is important to consider whether Buffett retains his uncanny ability to pick the right stocks at the right time. Despite some evidence which suggests otherwise, Buffett’s stock selection remains unparalleled. Adding some of his stock picks to your portfolios could boost profits significantly. Berkshire reported adjusted second-quarter 2018 earnings of $6.9 billion, soaring 67.3% year over year. This improvement was mainly attributable to solid results across all segments. Revenues increased 8.6% year over year to $62.2 billion. Pretax income came in at $15.1 billion, surging 146% year over year. At the reported quarter-end, cash, cash equivalents and the U.S. Treasury bills were approximately $111.1 billion. This represents a quarterly increase of $2 billion. Ultimately, this is a long-standing concern for Berkshire and its shareholders. However, the recently amended buyback program should soon address this issue. A section of analysts have indicated that since March 2009, Berkshire has failed to significantly outperform the Dow and S&P 500. But this fails to negate the fact that Berkshire has yielded a staggering return of more than 700% since inception. In any case, Buffett believes in purchasing shares of great companies and holding them for a considerable period of time. At this point, Buffett’s largest stake is in Apple (NASDAQ:AAPL) and he has minted billions from this investment. Berkshire mentioned in its second quarter earnings release that its stake in Apple was worth $47.2 billion as of June 30, 2018. As of Aug 4, Apple’s share price was $185.11. This means that Berkshire currently holds around 255 million shares of Apple and its stake in the iPhone maker has increased significantly. In fact, analysts skeptical of Berkshire believe that the stock is failing to outperform the fact because it doesn’t hold more popular tech stocks. Instead, Buffett prefers to hold financial, airline and consumer stocks. Berkshire has delivered a stunning second quarter earnings performance, reflecting all-round strength. Skeptics think that the stock has failed to outperform the market significantly in recent times. But Berkshire’s long-term performance is outstanding and Buffett retains his legendary reputation as one of Wall Street’s best minds. Adding some of Buffett’s stock picks to your portfolios makes for a smart move. We have narrowed our search to the following stocks based on a Zacks Rank #2 (Buy) and other relevant metrics. Apple third-quarter fiscal 2018 results created new records in a seasonally slow period. Earnings of $2.34 per share not only crushed the Zacks Consensus Estimate by 17 cents but also surged 40.4% year over year. Apple’s expected earnings growth for the current year is 26.8%. The Zacks Consensus Estimate for the current year has improved by 2.5% over the last 30 days. Goldman Sachs Group (NYSE:GS) second-quarter 2018 results recorded a positive earnings surprise of 28.1%, reflecting the highest strong second-quarter net revenues in nine years. Goldman Sachs’ expected earnings growth for the current year is 26.4%. The Zacks Consensus Estimate for the current year has improved by 7.1% over the last 30 days. United Parcel Service (NYSE:UPS) reported second-quarter 2018 earnings (excluding 23 cents from non-recurring items) of $1.94 per share, surpassing the Zacks Consensus Estimate of $1.92. Earnings increased 22.8% on a year-over-year basis. United Parcel’s expected earnings growth for the current year is 20.7%. The Zacks Consensus Estimate for the current year has improved by 0.3% over the last 30 days. Verizon Communications (NYSE:VZ) continued its solid performance in second-quarter 2018, primarily led by the wireless business. The company recorded healthy top-line growth led by solid service revenues. Verizon’s projected growth rate for the current year is 24.3%. The Zacks Consensus Estimate for the current year has improved by 1.4% over the last 30 days. Phillips 66 (NYSE:PSX) posted second-quarter 2018 adjusted earnings of $2.80 per share, which surpassed the Zacks Consensus Estimate of $2.16. The bottom line increased from the year-ago quarter’s figure of $1.09. The upside came on the back of higher contribution from all the segments. Phillips 66’s expected earnings growth for the current year is 72.9%. The Zacks Consensus Estimate for the current year has improved by 8% over the last 30 days. 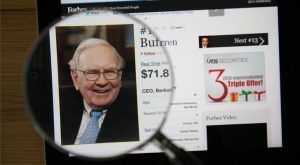 Article printed from InvestorPlace Media, https://investorplace.com/2018/08/boost-portfolio-returns-5-warren-buffet-picks-ggsyn/.